For example a 18-55mm lens would have a 3x optical zoom, and a 18-200mm lens would have a 11x optical zoom. Is that right? The "times zoom" notation is simply the big number divided by the small one, so the examples you give are correct. "3x zoom" simply means the longest focal length is three times the shortest. This number really isn't very useful, though. On point and shoot cameras, this value became popular in marketing because the widest focal length was generally about the same across all models on the market: they all had a wide-normal field of view. That made the times-zoom a reasonable way to compare how far one can zoom in to get a closer view of a distant subject. The market is more varied now, so that's not so useful. And with interchangeable lenses, the widest angle of any given zoom can be pretty much anything, so "times zoom" is not useful at all on its own. There is no standard "base" number that the "×" starts from; you go from whatever the widest focal length on that particular lens happens to be. An 18-55mm and a 70-200mm are both about "3x zoom", but a very different range. On the other hand, the zoom ratio does give you an idea of how much focal length flexibility the lens has, and usually higher numbers are a clue that there will be more compromise on image quality (and/or price, size, and weight). Photography is a field with a lot of jargon and a lot of numbers to learn. That can be intimidating to would-be photographers who want to concentrate on images, not "tech stuff". A simple number, without any metric-system units, is far less intimidating than needing to learn all about focal length and angle of view, so I don't think the marketers are all wrong to focus on this number for basic cameras. For interchangeable lens cameras, like digital SLRs or mirrorless compact system cameras, in some ways the complexity of using focal lengths is a selling point. Intermediate and advanced users may prefer to be given the straightforward facts instead of having to decode more-removed numbers like times-zoom. In some ways, giving the angle of view instead of focal length might be preferable, but that hasn't really caught on — probably because it's really not very hard to get a sense for what different focal lengths mean for field of view on your own camera, once you get over the initial learning bump. There is also another thing to consider. As you zoom in with linearly in millimetres, the actual field of view change is not linear. Zooming 2mm in when at 17mm will result in a much larger change in the field of view than zooming 2mm further at 200mm. It will depend on how you define the "zoom factor". Is it field of view or focal length? 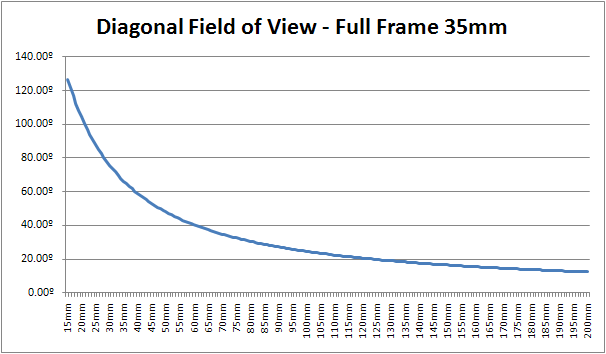 Here is the actual field of view graph for 1mm increments from 15mm to 200mm on a 35mm SLR. This was generated at http://www.howardedin.com/articles/fov.html and the diagonal was made simply with the hypotenuse algorithm h²=x²+y². The graph itself shows in 5mm increments. That's exactly what it means. The "zoom power" of a lens has no meaning except as the relationship between the longest and shortest focal length of the lens. For instance, even on a "bridge" or "ultrazoom" camera, one camera being marketed as a 30X zoom and another as a 28X zoom doesn't tell you whether the longest field of view is longer or the widest is wider, just that the lens has a greater range between the two. Yes you are correct both are 3x lenses. I think you you may be confused with the terminology from the compact camera world. When you are talking about compact most cameras have nearly identical widest focal length. This may be the cause of your confusion. For example this page from dpreview from lists canon compact and their zoom ratios. You can see that Canon PowerShot ELPH 320 HS (IXUS 240 HS) and Canon PowerShot A2300 are both listed as 5x cameras but the focal length of the earlier model is 24 – 120 mm whereas the later is 28 – 140 mm. You have already gotten direct answers to your question, so I'll comment a bit on this "X factor" as you call it. Basically it is a measure of the "zoominess" of the lens. A 1x lens is no zoom at all, just a fixed (also called "primary") lens. The larger the X number, the more the lens can make a difference by zooming. Why do you care? Mostly you don't. The range of focal lengths the lens can cover is more relevant to how you are going to use it. A 35-70mm zoom would be used in very different situations than a 150-300mm zoom, although both are "2x". What the X number does tell you is a rough measure of how much compromise was made in the lens design. Everything is a tradeoff, and zoomability is not free, both in $ to allow for the zooming and in optical quality. All other things being roughly equal, a 2x zoom will have better optical quality than a 8x zoom. Of course other things are rarely equal. There are things lens designers can do to get better optical quality in zoom lenses, but those cost money, may lose light, cause more internal reflections, limit the aperture range, etc. These can be mitigated to some extent by throwing money at the problem, but eventually you hit other limits due to physics or the available construction techniques. The main message is that while high range zooms are nice to use, they have other drawbacks. You have to consider how much the flexibility and adaptability of a zoom is worth it to you in various situations. Just blindly going for a high-X zoom because it will solve all your problems ignores a lot of the issues. I just re-read this and realize that it may sound somewhat against zoom lenses. That is not the intent at all. They have their place, as do fixed lenses. The lens I probably use more than any other is a zoom, but I also own a number of fixed lenses, in fact more fixed lenses than zooms. The point is to be aware of the tradeoffs and chose the right tool for the situation accordingly. It is a little complicated as field stops values might be different so you be comparing apples to oranges. In general your focal length is like a radius so a lens that is 18- 55 millimeter change in focal length would have a 3.05 change in radius. Allowing that the 18 mm to be your reference picture, if you then adjusted to 55 mm you would be taking a picture that was 3.05^2 or had a magnification factor of 9.3 as the angular area you are looking at goes at the square of the radius. Canon FX 50 (50 times zoom) No zoom .. Focal Length 32.5mm Lens 4.3 to 210mm Full zoom ... Focal Length 210mm (this is at the 50 times zoom). The full zoom on the Sony lens 55-210mm got as close as around 70mm on the Canon. Not the answer you're looking for? Browse other questions tagged lens zoom focal-length or ask your own question. Difference between zoom and focal length? What is the conversion between focal length and times zoom? How to work out the base “zoom magnification” of a lens? How to calculate the zoom power (X factor) for a lens?